It’s very easy to be a bad parent. It’s harder to be a good parent most of the time. It’s impossible to be a great parent all of the time. We can’t be too hard on ourselves for those times we don’t handle well. We can’t beat ourselves about the shouting or a smack or losing our temper. We can though (and must) strive to be a good parent most of the time if we want to be proud of our grown kids and proud of ourselves and the job we have done with them. I always regret it afterward. But I don’t beat myself up about it anymore. Any such outbursts act as a red flag. Time to put more effort into better managing my reactions to their behaviour. Time to remember to take a deep breath and count to ten before reacting. Because it is so easy to forget we have to manage ourselves before we can properly manage our children. The daily process of getting the day done is often stressful and grinding – if we let it. I don’t want to look back at the years I spent raising my kids and have regrets. I don’t want to be the grandmother that says I wish I had been less hard on them, worried less about controlling them every second, been less concerned with ensuring their perfect obedience 100% of the time. I want us to look back and remember giggles, and tickles and laughing and fun and warmth and love and safety and security and happiness and joy and wonder and LOVE. So to help me in this process of self management I like to reinforce those practices that help me stay on track by reading and learning from others. This post from Leo Babauta Zen Habits:Breathe is just such a read. Enjoy. 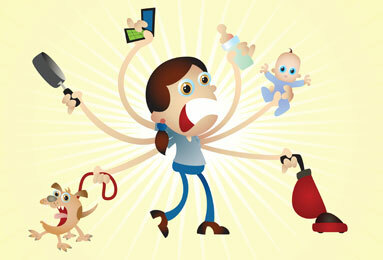 I often get asked how I can do so much while having six kids. My short answer, and all you really need to know, is my wife Eva is awesome. I couldn’t do half what I do without her. She is the reason Zen Habits is able to exist. And so if you want parenting advice, you’d be smart to ask her. She doesn’t, however, have a blog. And so I’ll share some things that we both do that make our jobs as parents easier. These are Very Important Rules that must never be broken by any Serious Parent … until, of course, you want to break them. The first rule of Rules of Effortless Parenting is that you should always break rules. To read the rest of the post click through to the post on Leo’s site here.